PV devices are characterized by their response to light in a reference spectrum. When a device is tested in a lab or outdoors, the spectrum of the light source may not be the same as that of the reference spectrum. The effect of this difference on performance is typically quantified by a spectral mismatch factor. If the shape of the I-V curve is not sensitive to the spectrum of the light source, but only to the short circuit current and the cell temperature, then it is possible to estimate a spectral mismatch factor using IEC 60904-7 : “Computation of the spectral mismatch correction for measurements of photovoltaic devices”. where is the wavelength of light, is the electron charge ( Coulomb ), is Plank’s constant ( J*s), and is the speed of light ( m/s). 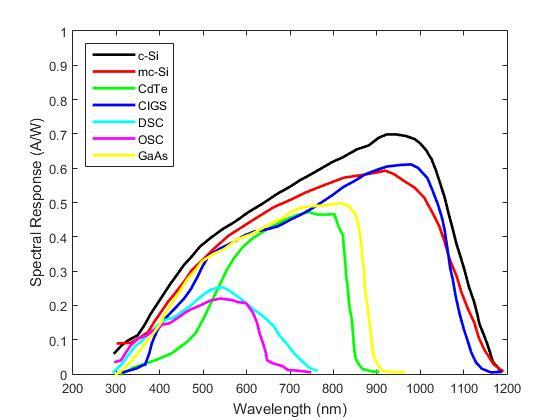 The figure below shows typical spectral responses from a variety of PV cell technologies.